Not Only Books... You Can't Judge Music By Its Cover! You Can't Judge Music By Its Cover! Previously, I wrote a Beginner's Guide to Finding Belly Dance Music. I mentioned what to be on the lookout for, and shared some favorite picks of my own. And now, because most of us don't read Arabic and must rely on the look of a tape or CD and the picture on its cover when making our decisions - I pass on a list of what not to buy. These are purely subjective suggestions, of course, but they may save you from being misled or disappointed. This artist has made two other recordings that I think are fabulous: Rhythms from the Orient and Tribute to Om Koulsoum. But this one is quite different. On my copy (audio cassette), the song titles are listed in Arabic on the outside cover; inside, however, there are transliterations in English, along with the names of the composers. Most of the songs are hits by some of the greatest Arabic artists: Mohammed Abdel Wahad, Farid Al Atrache, and the Rahbani Brothers. But only a couple of tracks sound like belly dance music to me, and I find the rest to be fairly sappy. And I could most definitely live without the Arabic-ized cover version of Zorba the Greek! The cover features the cathedral on St. Basil's Square in Moscow, with a dancer holding a tambourine above her head. I confess I have not heard this recording, but the song titles are those of Western classical music. 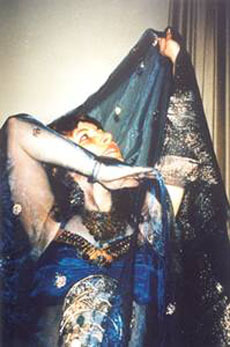 The cover picture is of well-known dancer Eva Cernik, wearing a black vest and maroon skirt with a multi-colored belt; she's swirling a maroon veil. But don't be fooled - this is not belly dance music. Another non-belly dance recording, but that's confusing because Laura is featured on another HMC belly dance recording - Laura at the Harem - which is very good. I haven't heard Laura in Balady, so I won't comment at this time. This recording opens with Marilyn Monroe's famous I Wanna Be Loved By You - and I can't remember anything else about the rest except that I thought it was dreadful! And certainly not belly dance music. All three are Turkish-style, although it's virtually impossible to determine this from the covers. I have included them here because most belly dance music is Egyptian or Lebanese in origin, and Turkish is very different... so if you buy one of these without realizing you're getting Turkish-style, you may be disappointed. Derbakke player Setrak Sarkissian is loved by dancers everywhere for his wonderful belly dance recordings. But, once again, this cover is misleading. On the front cover is the title Sahra with Samira, with a small picture of Setrak, so it's natural to think that it's Samira the dancer, especially since he has recorded several times for her. Only on the side edge of the tape - very easy to miss - does it say "Samira Toufik", who is a singer. Although it's been some time since I heard this tape, as I recall, the music didn't strike me as being very dance-able. The cover is entirely in Arabic, so let's talk about the picture first. The main picture shows the top half of a woman in a black turban, who is wearing a multi-colored floral-print bolero over a black bra. The smaller picture, bottom left corner, is of a man wearing a kelly-green shirt. The cover also has the words "Ar-Raks Ash-Sharqi", which is Arabic for belly dance - literally, "dance of the east". But trust me: this isn't. This is a relatively new series of piano-based instrumental arrangements of songs by popular singers. The covers are all alike: the name "ZoHo" in jagged, elongated characters, with a distorted image of the featured singer, all in shades of brown (except the letters, which are white). I purchased the Abdel Haleem Hafiz recording on the shopkeeper's recommendation, and expected something delightful. But I was very disappointed - it's elevator music, and far from making you want to dance... it will put you to sleep! This article originally appeared in the Fall 2001 issue of the Canadian dance publication, MID-BITS!